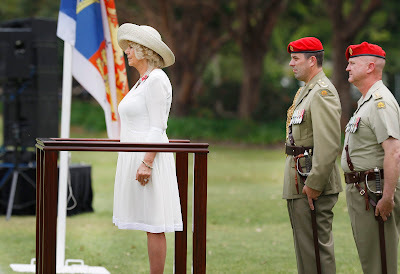 As part of their 2012 Australian tour, Their Royal Highnesses the Prince of Wales, Prince Charles and Camilla Duchess of Cornwall visited Australian Defence Force bases in Sydney, NSW, on Friday 9th November. During her visit to Victoria Barracks, Her Royal Highness, Camilla Duchess of Cornwall was appointed as Colonel-in-Chief of the Royal Australian Corps of Military Police, the first Colonel-in-Chief of the Royal Australian Corps of the Military Police in almost a century. The Royal Australian Corps of Military Police is a key element of the Australian Army; and Victoria Barracks is the home of Army's Forces Command. 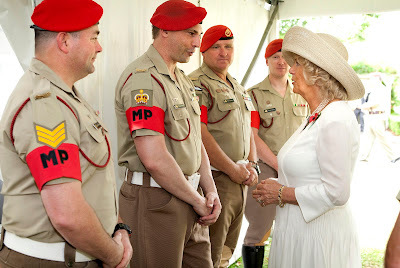 Her Royal Highness took the royal salute and inspected the Royal Guard and the Australian Army Band. Officers, Men, women of the Royal Australian Corps of the Military Police, It gives me enormous pleasure to address you today as your new and very proud Colonel-in-Chief. This is a very exciting time for me not only because of the great honour you have done me but also because it is my first trip to Australia and I deeply regret having left it so late. 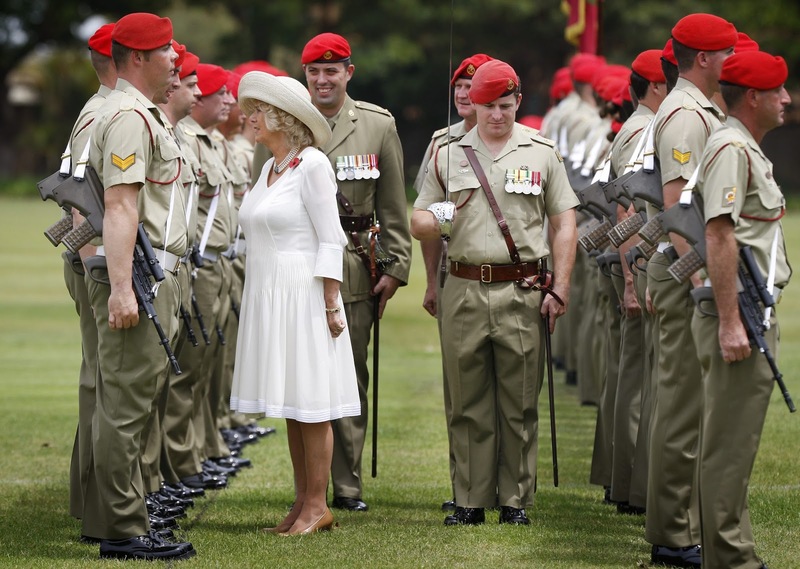 There has always been an association between members of the Royal Family and the Australian Army, including the appointment of Colonels-In-Chief to a number of Corps over the years. Her Majesty The Queen is Colonel-In-Chief of the Royal Military Police, with whom you have close professional ties and shared lineage. And so I was very keen to know who my predecessor was. I think you can imagine my delight and pride when I learned that in the prestigious 96 year history since your formation I have no predecessor and that I am, therefore and self-evidently, your first Colonel-in-Chief. I want you to know the pleasure that gives me and that I am also very well aware of the significance and honour that comes with this very special appointment. I am delighted to see that you are all wearing your rather dashing scarlet berets and wondered if the Colonel-in-Chief might possibly get to wear one, too? For almost a century, the Royal Australian Corps of Military Police has earned an esteemed position in both the Australian Army and the wider community. In both war and in peace, you have provided outstanding service to the Nation. This is a record to be cherished. You are a regiment who provides a unique and often difficult role, not only overseas on dangerous operational duties to Afghanistan, Iraq, East Timor and elsewhere, but also at home where your constant professionalism is required on a daily basis, policing the Australian Army and wider Defence Force. It seems to me you are never off duty - rather like my husband. But it is your families who provide you with peace of mind while you are away on long training exercises or overseas deployments. They provide the bedrock of support without which you cannot do such remarkable work. I do hope that I get to meet a number of you and, of course, your families today and over the coming years whenever I’m in Australia, which I hope will be often. Please remember how much my association with you all, as Colonel-in-Chief, means to me and what interest and concern I have for you all. Your duty to serve as members of the Royal Australian Corps of Military Police will always be ‘For the Troops and With the Troops’. I know you will have heard that many times before but I dare to say that is the first time you will have heard it from your Colonel-in-Chief. Her Royal Highness Camilla, Duchess of Cornwall, reviews the Military Police Royal Guard whilst on parade at Victoria Barracks, Sydney. Thank you very much for the nice video and pics! I enjoyed it and the pics also.WONDERFUL! !